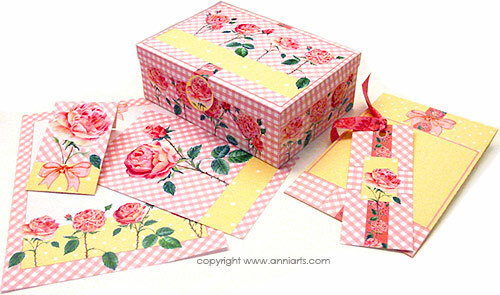 bookmark plus extra cards and envelopes have classic summer roses in full bloom. At least 5 – 10 cards and envelopes fit in the box depending on the thickness of paper or card used. Add a nice pen or other small gifts like a magnet or pin button to fill the box that has a generous capacity. This big set on nine pages can be either a notelet set or postcard set - so actually a two- in-one. The second set has extra cards, card backing, matching envelope, tags and pretty papers. Do you like your flower and gem? Should I add items? Scroll down to comment !